Anthony Joshua fulfils his IBF mandatory defense when facing Carlos Takam in Cardiff this Saturday. Fancy AJ to win the bout? 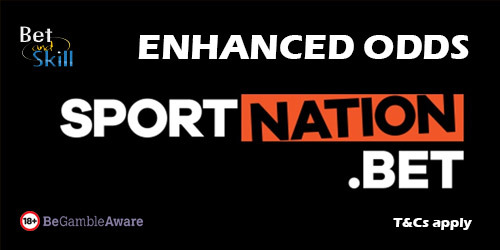 Claim a massive price boost offered by SportNation bookmaker! Get 33/1 Joshua to beat Takam! Anthony Joshua boasts an unblemished professional record of 19 KO wins from 19 fights, including a memorable triumph over Wladimir Klitschko at Wembley in April when he climbed off the canvas to send the Ukrainian veteran into retirement in round 11. He is a 1/50 favourite to win but you can claim a terrific 33/1 via this page! Simply register and deposit through the promotional page. Then proceed to place your bet on 'Anthony Joshua to beat Carlos Takam' in the 'Fight Winner' betting market at standard odds. This offer expires on as soon as the fight starts. Hurry up! 2. Make your first deposit and place £1 (max £1 qualifying stake) on Joshua to win at normal odds. 4. bonus credited on Monday morning. Place a series of bets at minimum odds of 2.00 with a minimum stake equal to the combined value of 5x bonus funds received and once such bets have settled, any bonus funds and winnings remaining will become withdrawal. System bets will not count towards the wagering requirement. Turnover requirements of 5x bonus funds before it is withdrawable as cash. This offer is valid to use once per customer. You will have two wallets in my account, Cash balance and bonus funds. Cash balance is used before bonus funds wallet. 6. Offer expires at start of fight. "Get 33/1 Joshua to beat Takam at SportNation (was 1/50)"